When the iPhone 4's screen was shattered, people said that the test wasn't valid. Only scratch-resistant. But it seems that "30 times harder than plastic" can still be scratched in normal use. I dropped it several times from a few feet onto a hard surface with no problem, and it acquired no scratches at all in my testing, even though I didn't use a case or coddle it. 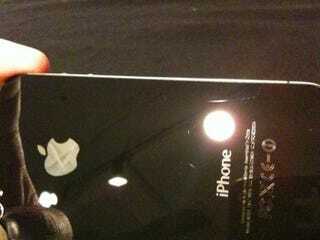 Just spotted on the iPhone 4's supposedly nigh-indestructible glass: scratches. Seriously. Not good! Of course, Apple's own claim was not to be scratch-proof, but scratch-resistant. In their advertising, Apple says that the iPhone 4's aerospace-grade glass is "Chemically strengthened to be 20 times stiffer and 30 times harder than plastic". According to them, "the glass is ultradurable and more scratch resistant than ever." But, they said it's 30 times harder than plastic, not 30 times more scratch-resistant than plastic, meaning that "more scratch resistant" might mean just 1 or 2 times more so than plastic, and less of an improvement over glass. Who knows.